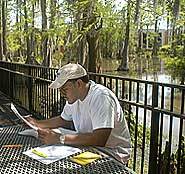 UL Lafayette’s College of Education is teaming up with the Lafayette Parish School System to offer a teacher leadership camp on Saturday. The teachers, counselors and administrators in Lafayette’s GearUp schools are returning to campus to re-ignite their fire for college and remind them of the fun and knowledge they obtained while in college. The program is designed to help the teachers, counselors and administrators with leadership ideas to encourage students to gear-up for post-high school and think about their futures so they can start preparing now. The program begins at 9 a.m. at Moody Hall and will end at 11:30 a.m. At noon, the tailgate begins at Cajun Field and ends with everyone attending the Ragin' Cajuns vs. Arkansas State game at 2:30 p.m. The morning program will include: (1) Data on display and Change yes you can; (2) How to create leadership teams to assist students in gearing up; (3) Educational leaders ... Stepping up to the challenge; and (4) Writing to envision your dreams and gearing up to meet them. Camp facilitators are College of Education professors Drs. Nathan Roberts, Dianne Olivier, Rayma Harchar and Toby Daspit as well as Michelle Salts co-Director of The National Writing Project of Acadiana. A second camp will take place in the spring and will focus on the role of counselors and how teachers can assist counselors in working with students to GearUp for college and beyond. GearUp is designed to help eighth and ninth grade students prepare for life beyond high school both college and career.